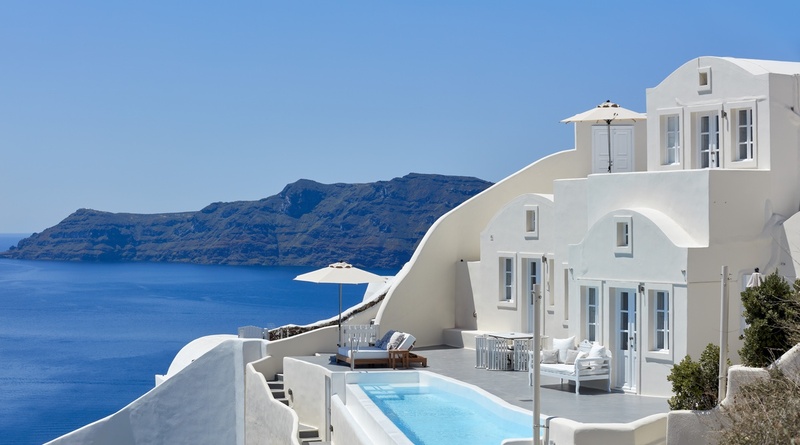 This luxurious cosmopolitan villa is the perfect house to discover Santorini’s beauty and culture or just relax by the pool in a sun-soaked world of your own. It has its own unique decor and minimalistic style with cosy spacious rooms that ensure a tranquil and restful sleep. The unique design of this exceptional villa provides lots of light and comfortable leisure options, especially the substantial open-plan living space with accompanying balconies where you can enjoy captivating views of the sea. It has been designed by the use of natural stone and whitewashed wood, all environmentally friendly materials, combining the traditional architecture with the modern one, satisfying the highest expectations of the guests who look for luxury and privacy in Greek islands. The property is fully equipped with high-quality audio systems and Wi-Fi throughout the building and outdoor areas. The real fun begins when going to the outdoor spaces, where there is a large private swimming pool and a spacious dining and seating area with views of the amazing sea. Enjoy a sunset cocktail by the pool or relax and exercise during the afternoon. It’s an experience you’ll never forget, living the Greek island lifestyle in the comfort of your own villa by the bay. 1 x Master bedroom with double bed and ensuite bathroom. Access to private terrace and Jacuzzi. All above services are available upon request.